Dissolve the sugar in the warmed water. Add the yeast, Stir and let stand 10 minutes. Meanwhile, add the flour to a large bowl together with the salt. Add the cubed butter and with your fingertips, rub the butter into the flour until you have a uniform, sandy crumb mixture. Make a well in the centre of the flour/butter mixture and pour the yeast mixture into the well. With a spoon at first, gently draw the flour from the outside into the centre and stir until a rough dough forms. Remove dough to a floured surface and knead, adding more flour as needed, until you have a smooth dough. *You aren't aiming for a long knead here. Just enough to incorporate enough flour to bring the dough together into a smooth (not sticky) ball. Put the dough ball into a clean bowl, cover with plastic wrap and leave to rise for 30-40 minutes. It may not to rise completely to double in this time. Line a 10x15-inch rimmed baking sheet with parchment paper and set aside. Put the dough on a floured board and divide into two parts with one part being just slightly bigger than the other (this is the part that will be the base of the tart, so it will be a bit bigger). With the larger of the two dough pieces, roll into a rectangle about 1/2 inch wider and longer than your baking sheet. Roll the dough piece around your rolling pin, then transfer to the prepared baking sheet, laying it evenly over-top with it extending over the edges by 1/2 inch all around. Using your fingers, press the excess around the edges up against the sides of your baking sheet all the way around. 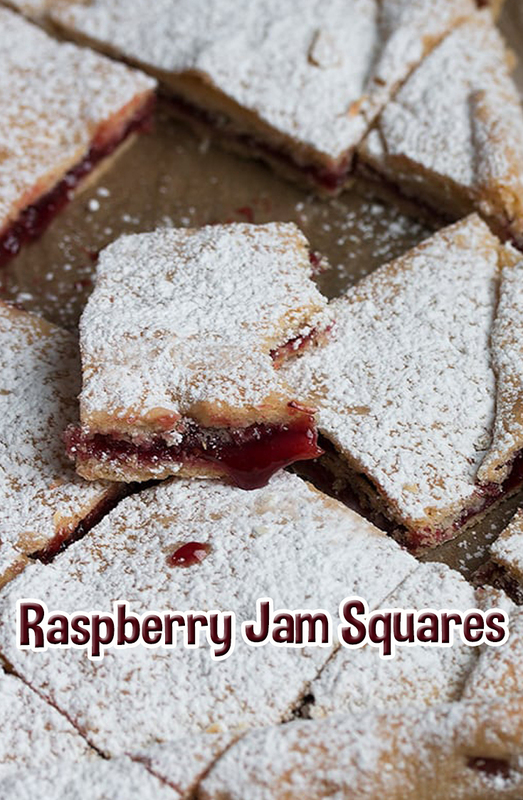 Spread your jam evenly over the bottom of the dough. With your second piece of dough, roll into a rectangle exactly the dimensions of the inner part of your baking sheet. Roll around your rolling pin and carefully lay over-top of the jam, adjusting so that is covering completely. Starting at a corner, start folding the dough that is along the sides over the top dough, pinching together slightly to seal. With clean scissors, make small cuts through the top layer of dough, cutting about every 2-3 inches apart all over the top. Bake in preheated oven for 40-45 minutes or until lightly golden. Allow to cool completely. Carefully remove to a cutting surface, by sliding off the tray with the parchment paper still underneath. Dust the top with a generous sprinkling of icing sugar, then using a sharp knife, cut into bars diagonally as shown in the recipe photos.